You know your mother,and father; you know your friends;you know your family;you know your significant other,even your pastor, Bishop,and priest . But do you know God personally ? How come you know others, more than you know the Almighty GOD, Creator, and CEO of the universe ,your Heavenly FATHER. LET’S SEE IF YOU KNOW HIM,ANDROID HOW MUCH YOU KNOW HIM. “Now by this we know that we know Him, if we keep His commandments. He who says, “I know Him,” and does not keep His commandments, is a liar, and the truth is not in him. But whoever keeps His word, truly the love of God is perfected in him. By this we know that we are in Him. He who says he abides in Him ought himself also to walk just as He walked. Brethren, I write no new commandment to you, but an old commandment which you have had from the beginning. The old commandment is the word which you heard from the beginning. Again, a new commandment I write to you, which thing is true in Him and in you, because the darkness is passing away, and the true light is already shining. He who says he is in the light, and hates his brother, is in darkness until now. He who loves his brother abides in the light, and there is no cause for stumbling in him. But he who hates his brother is in darkness and walks in darkness, and does not know where he is going, because the darkness has blinded his eyes”. (1 John 2:3‭-‬11 NKJV). After you believe,and accept Jesus , then it’s time to know Him. To know Him is to love Him,to trust Him,to depend on Him,to have a relationship with HIM? 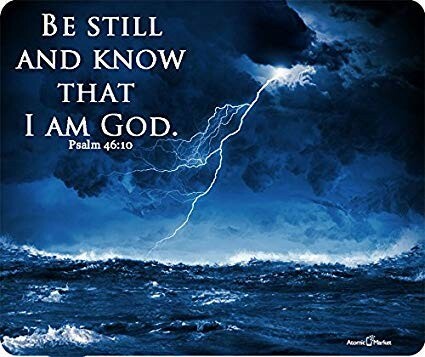 “Be still, and know that I am God; I will be exalted among the nations, I will be exalted in the earth! (Psalms 46:10 NKJV). “Likewise the Spirit also helps in our weaknesses. For we do not know what we should pray for as we ought, but the Spirit Himself makes intercession for us with groanings which cannot be uttered. Now He who searches the hearts knows what the mind of the Spirit is, because He makes intercession for the saints according to the will of God. And we know that all things work together for good to those who love God, to those who are the called according to His purpose. For whom He foreknew, He also predestined to be conformed to the image of His Son, that He might be the firstborn among many brethren. Moreover whom He predestined, these He also called; whom He called, these He also justified; and whom He justified, these He also glorified”,(Romans 8:26‭-‬30 NKJV). “Now this is the confidence that we have in Him, that if we ask anything according to His will, He hears us. And if we know that He hears us, whatever we ask, we know that we have the petitions that we have asked of Him. We know that whoever is born of God does not sin; but he who has been born of God keeps himself, and the wicked one does not touch him. We know that we are of God, and the whole world lies under the sway of the wicked one. And we know that the Son of God has come and has given us an understanding, that we may know Him who is true; and we are in Him who is true, in His Son Jesus Christ. This is the true God and eternal life”. ( 1 John 5:14‭-‬15‭, ‬18‭-‬20 NKJV). “For this reason I also suffer these things; nevertheless I am not ashamed, for I know whom I have believed and am persuaded that He is able to keep what I have committed to Him until that Day”. (2 Timothy 1:12 NKJV). LET’S DO AS THE APOSTLE PAUL SAID ,AND DID. “But what things were gain to me, these I have counted loss for Christ. Yet indeed I also count all things loss for the excellence of the knowledge of Christ Jesus my Lord, for whom I have suffered the loss of all things, and count them as rubbish, that I may gain Christ and be found in Him, not having my own righteousness, which is from the law, but that which is through faith in Christ, the righteousness which is from God by faith; that I may KNOW HIM and the power of His resurrection, and the fellowship of His sufferings, being conformed to His death, if, by any means, I may attain to the resurrection from the dead. Not that I have already attained, or am already perfected; but I press on, that I may lay hold of that for which Christ Jesus has also laid hold of me. Brethren, I do not count myself to have apprehended; but one thing I do, forgetting those things which are behind and reaching forward to those things which are ahead, I press toward the goal for the prize of the upward call of God in Christ Jesus. Therefore let us, as many as are mature, have this mind; and if in anything you think otherwise, God will reveal even this to you”. (Philippians 3:7‭-‬15 NKJV). Is God the most important person in our lives? +Do we love God more than anyone or anything, and would we do anything for Him? +God is with us all the time, but the only times we spend with Him is when we direct our attention to Him in Love, Thanksgiving, Praise, Worship, Obedience and such like things. 17 And he (Jesus) is before all things, and by him all things consist. 18 And he (Jesus) is the head of the body, the church: who is the beginning, the firstborn from the dead; that in all things he might have the preeminence. PREEMINENCE: Before all and above all. “Therefore by their fruits you will know them. “Not everyone who says to Me, ‘Lord, Lord,’ shall enter the kingdom of heaven, but he who does the will of My Father in heaven. Many will say to Me in that day, ‘Lord, Lord, have we not prophesied in Your name, cast out demons in Your name, and done many wonders in Your name?’ And then I will declare to them, ‘I never knew you; depart from Me, you who practice lawlessness!’ “Therefore whoever hears these sayings of Mine, and does them, I will liken him to a wise man who built his house on the rock: and the rain descended, the floods came, and the winds blew and beat on that house; and it did not fall, for it was founded on the rock. “But everyone who hears these sayings of Mine, and does not do them, will be like a foolish man who built his house on the sand: and the rain descended, the floods came, and the winds blew and beat on that house; and it fell. And great was its fall.”(Matthew 7:20‭-‬27 NKJV). +Let’s continue to guard our relationship with the Lord by keeping Him before all and above all. Hallelujah it His Holy Name. This entry was posted in Daily Message and tagged KNOW GOD FOR YOURSELF, know that He is God.